The official Notification for AILET 2019 has been released by National Law University Delhi(NLU-D) on January 3, 2019. As per the official AILET Notification, the All India Law Entrance Test (AILET) 2019 will be held on May 6, 2019. The law aspirants interested in pursuing five-year integrated and postgraduate law programmes apply online from January 03 to April 07, 2019. As per the AILET 2019 Notification, the AILET Exam will be held on May 6, 2019. Along with the AILET Exam, other important dates have also been announced. Candidates can fill the AILET Application Form 2019 from January 4, 2019, until April 7, 2019. The 3 months time is given to the Law aspirants to duly filled - in the AILET Application Form after paying the AILET Application Fees. Similarly, AILET Admit Card 2019 will be available to download on the official website from April 14, 201, and the AILET Result 2019 will be announced on May 24, 2019. Under AILET 2019, the reservation criteria are 15% for SC, 7.5% for ST, 5% for PWD, one additional seat for Kashmiri migrants, and two supernumerary seats for the residents of Jammu and Kashmir. 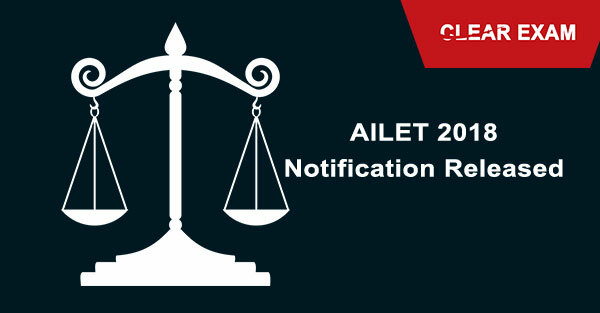 AILET 2018 Notification has been released. Check all the latest updates on AILET 2018 Exam.